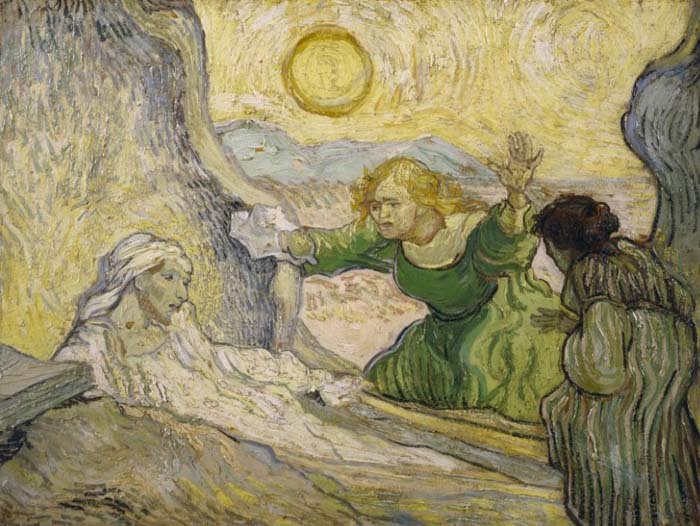 I remember first seeing Van Gogh’s Raising of Lazarus in the Van Gogh Museum in Amsterdam in the early 1990s. I remember then being struck by the thick green and yellow pigments and the way the recently dead Lazarus and the awestruck family members were pulled into a tight triangular dance by a blazing sun. Van Gogh has taken some of his inspiration from a painting on the same theme by Rembrandt. Rembrandt also used a triangular shape to coordinate his characters, but in his work they were smaller and the overall atmosphere darker. Van Gogh, on the other hand, has moved in for a closer look, emphasizing the raw drama of the moment by tightening the composition and electrifying the lines and colors. Both the swirling landscape and the shocked family members remind us of the artist’s hand and style. Are they rejoicing at their brother’s return to life? Where is Jesus in this painting? Some have suggested that the red beard Van Gogh put on the Lazarus figure is intended to be an autobiographical reference. They also suggest that perhaps the artist drew parallels between the story of this biblical character being summoned back to life, his family and community and the artist’s own hoped for journey out of isolation and despair. In the biblical story of the raising of Lazarus (John 11:1-45) the calling of the sick man back into life was actually only half the battle. John gives us a sketch of three `communities.’ At the beginning of the story Jesus had to persuade his reluctant disciples that it was time to return to Jerusalem. These disciples were a community bound together by fear and misunderstanding. Nonetheless they travelled with Jesus and joined the mourners and family who were grieving their loss. Next John records Jesus’ words of prayer that serve as a window onto the community between the Son and Father (John 11: 41-42). Throughout John’s Gospel Jesus describes himself as the obedient son, carrying out the desires of his father. In this story we clearly see that the Father’s wish is for restoration and life. Now Jesus hopes to inspire yet another community: the small group of mourners gathered here. Before Jesus calls Lazarus back to life, he tells this group of mourners, fearful disciples and skeptical family members that they have to do two things. They are told to violate cultural norms by moving a gravestone, then risk possible ritual pollution by touching a dear friend who has very recently been a corpse. And yet closeness and contact are essential, because Jesus asks them to unbind the grave clothes and set him free. Will they do it? We can surely recall the marginalization of the arts and the isolation of the artist in some religious circles in days gone by. It is true that these things are changing. I like to think that in recent years the arts and the artist have been revived and invited to find their place in the life of the church. If we go a little further with the metaphor, perhaps we can ask if some of our settled ideas about the ‘place’ of the arts and the ‘role’ of the artist are large stones that sometimes get in the way and block out the light. Perhaps we can ask if we have trouble helping the artist out of the tight bindings of our expectations and into the family rooted and grounded in liberating grace. We are getting better at inviting the arts back into the life of the church and asking artists to come out of their isolation and rejoin the family. Is Jesus truly in the picture? How are we at moving heavy stones and unwinding grave clothes? Steve Scott directs CANA (Christian Artists Networking Association.) CANA seeks to engage, connect and empower artists in different parts of the world by running international conferences (SE Asia/Eastern Europe) and maintaining online communication (see http://cana-arts.blogspot.com). Steve's two books on art Crying for a Vision (1991, Stride UK, reprint 2005 alivingdog) and Like A House on Fire (1997, Cornerstone Press, reprint 2002 Wipf and Stock) are still available from Amazon, and his next album Emotional Tourist (a retrospective) is due from Arena Rock records in Oregon.